Well, that was fun. It's not every day that you can say Scotland won a qualifying game. Three points are always welcome. We'll be back on Wednesday night with full coverage of the Scottish Premiership clash between St Johnstone and St Mirren. "The fans were looking for a few goals. We missed a hat full of chances and Marc Mculty could have had a hat-trick, but it was great to see someone get into those positions. "We know the Russians are strong and Belgium are favourites, but the campaign is not over this early. There will be blips in the ensuring games and we need to be better. We need to get our best players int the team." Elsewhere in Group I Belgium have taken the lead against Cyprus after just 10 minutes with a goal from Eden Hazard. Although a Belgian win doesn't seem like a deciding factor for Scotland at this moment in time, ensuring Cyprus don't pick up any bonus points against the team that are expected to run away with first place could prove pivotal to Scotland's hopes of qualifying. Scotland FIFA rankings over the last two years.Image caption: Scotland FIFA rankings over the last two years. FIFA rankings aren't as popular as they once were, but looking at Scotland's placing in the world over the last two years offers an interesting perspective for our plucky, little nation. During Gordon Strachan's last year in charge - in which Scotland won four and drew three from eight games - we jumped up from 67th to 32nd. Not bad all. However, during McLeish's first year in charge Scotland's standing has plateaued and somewhat slumped to a halt, falling from 31st to 40th. After a 3-0 defeat to Kazakhstan and a 2-0 win over San Marino, we're likely to see Scotland's ranking take a further hit. Alex McLeish shrugged off the booing he endured from Tartan Army during the game. "They were frustrated we didn't kick on from the first goal," the Scotland manager said in his press conference. "I have heard booing over the years during my career. That happens in football. Sometimes the players get nervous about that and that's why you don't get the free-flowing football you saw in November. "Over the two games we had a mountain of changes and it's not easy when you don't have momentum or rhythm. McLeish also defended his decision to leave winger James Forrest out of the starting line-up. "We had fresh players coming in," he said. "James has played a lot of football, he's an integral part of the squad and wanted to play, but I told him I was going to change the team regardless. There was nothing frightening about it." On Russia wining 4-0 in Kazakhstan, McLeish added: "It's early days. Russia probably watched our video and decided don't defend the way Scotland did for the first two goals. "We got a little nervous when we didn't get the second goal. San Marino had a couple of moments but we were the superior team." Have a vote: Can Scotland still qualify? More of you have got in touch on Twitter to talk about tonight's game. Let us know what you think by tweeting us at @BBCSportScot. Nick Murdoch: Regardless what you think of McLeish, the players are dire. Bad touches, control and no one can cross a ball in modern football! Regardless who your manager is you play to your own standards. Chris Laidlaw: Hang on.This isn’t good, granted. But we have failed miserably over the last 25 years by selecting the same hum drum rubbish.This selection is new and refreshing and may take two-three years to develop a good team. After 25 years of rubbish, can we not give two-three years to get things right? Paul Wishart: Poor balance to the team. Everything down the left better when James Forrest came on. Still looked like a team struggling to understand tactics. Where was Johnny Russell playing? Scotland manager Alex McLeish has spoke to the media after tonight's 2-0 win over San Marino. "We started really well, got the early goal. We said to the lads before the game if we get a goal, look for another as quickly as possible. "We got into a little rut, with some stray pass which was unlike the excellent players we have. Tiredness was creeping in with one or two players, resulting in the substitutions. "But the second goal settled everybody and we made four or five chances after that which we really should have taken. It was great to see the guys come into the team and making the chances. "It's been a difficult weekend. We knew 1-0 or 2-0 wasn't going to be looked at in a great light, but it was important for us to win after the disappointment in Kazakhstan. Everyone is hurting on that one. "We didn't get the avalanche of goals everyone was looking for, but there were reasons for that. There was agitation when we didn't get the second goal, but the players are human." That's right, you voted San Marino substitute Nicola Nanni as your man of the match. Worth noting every San Marino player scored higher than Andy Robertson, Scotland's top man. Today's result now means that Scotland have three points on the board but it hasn't actually changed their standing in Group I an awful lot. Alex McLeish's side are still fourth on goal difference, level on points with Cyprus, Russia, Belgium and Kazakhstan. The current standing puts things in to perspective, with a home clash with Cyprus and then a very tricky away tie in Belgium awaiting Alex McLeish's side in June. Scotland manager Alex McLeish said his side appeared to still be affected by the 3-0 reverse in Kazakhstan on Thursday. He told Sky Sports: "We started really well. It was a wee bit nervy, it's been a tough few days for everyone. When we got the second goal you saw the team relax and we created five or six more chances. "It was surprising to see a few passes go astray. We expected the level to be a bit better than that. But the result in Kazakhstan affected a few people. "They [the critics] were looking for five or six, and we accept that, but Marc McNulty looked really sharp and he could have had a hat-trick with his chances alone. "It was important we won the game, we dealt with it. We did want more goals of course. In the end we should have had four or five. "We dealt with the second game if not fantastically, but it was professional done." Remember, the Player Rater is still open! The highest-ranked Scotland player against Kazakhstan was Scott McTominay, with a score of 2.69. A high bar indeed... If you want to make your point be sure to head over there and start ranking each player. 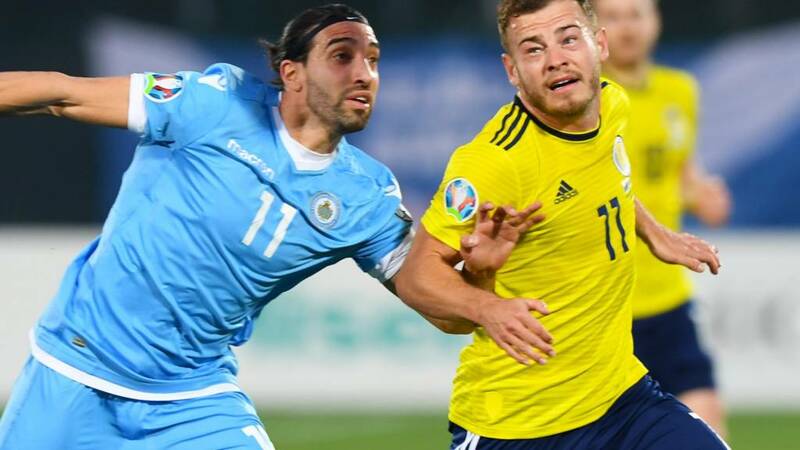 Scotland's goalscorers Kenny McLean and Johnny Russell said it was "frustrating" not to win by more. Russell told Sky Sports: "It was tough to find spaces. We could have done more, we could have created more. It's a win we were expected to get but it could have been a lot better from us." McLean added: "It was the perfect start, but they [San Marino] were never going to change. We could have got more goals." Some punters have got in touch on Twitter at full time. Let us know what you think by tweeting us at @BBCSportScot. Neil Barnes: Alex McLeish never was our long-term answer. Tartan Army immense. Our football-loving nature deserves so much better. Lack of ambition from SFA as always. David MacNab: Overly laboured build up play with poor delivery & choices. Poor. Ruairidh Cormack: It’s a victory. However, still huge weaknesses tonight against the worst ranked nation in the world. The match should have been buried long before the 74th minute. A win but very sceptical in terms of the rest of campaign. Quote Message: It wasn't an inspiring performance. There was a lot of pressure on the management and players and history tells you San Marino is a team we've never beaten by many goals. It's job done, but won't quiet anything down over the manager's position. He has to get results and performances in the next two games to quell the fans' attitude. It wasn't an inspiring performance. There was a lot of pressure on the management and players and history tells you San Marino is a team we've never beaten by many goals. It's job done, but won't quiet anything down over the manager's position. He has to get results and performances in the next two games to quell the fans' attitude. As expected, Scotland dominated possession and shots throughout the match.